Because of the quick thinking of four everyday people — including one ninth grader — a 70-year-old man’s life was saved. Bruce Dailey collapsed in November during a lifeguard review class at Afton Central School, according to the American Heart Association. Fellow lifeguard review students Jennifer Jones, Lila Harris and Sue Shove started CPR. As soon as Dailey collapsed, Oliviah Harris-Morris, a ninth-grade student at Afton Central School, ran to get the Automated External Defibrillator (AED) without being asked. She knew exactly where the AED was because of CPR trainings given every year to all students in Afton’s physical education class. Dailey had to be shocked three times before he made it to the hospital. Jones, Harris and Shove performed more than nine minutes of CPR along with first responders to keep him alive. “Teaching Hands-Only CPR in our schools allows us to train the next generation of lifesavers,” said Gina Chapman, Regional Director for the American Heart Association/American Stroke Association in a statement. The four heroes were honored by the American Heart Association at the Heartsaver Hero Award presentation at Afton Central School Wednesday. “You have no idea how good it feels to be here today,” Dailey said during the Heartsaver Hero Award presentation. The Heartsaver Hero Awards honor bystanders who take action to save sudden cardiac arrest victims. 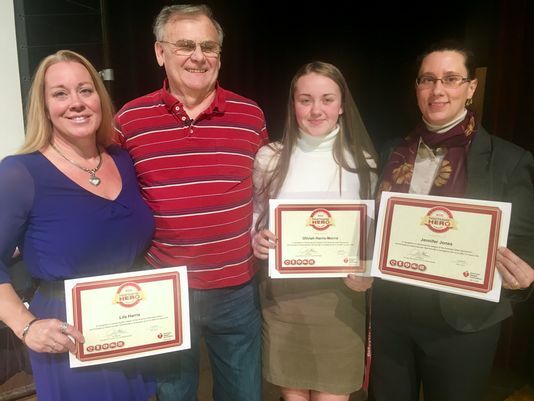 “I was very fortunate that the people I was with were prepared,” Dailey said during the presentation..
Jones, Harris, Harris-Morris, and Shove were all presented with Heartsaver Her Awards during an assembly. In addition, Senator Fred Akshar honored the group and also visited the school during the last school-wide Hands-Only CPR training session. “I’m so proud to be in my home town of Afton to honor four remarkable individuals who remembered and utilized their training when it was needed most — to save a life,” Akshar said. More than 350,000 patients in the U.S. suffer cardiac arrest outside the hospital every year, according to the American Heart Association. About 90 percent of people who suffer out-of-hospital cardiac arrests die. But CPR, especially if performed immediately, can double or triple a victim’s chance of survival the American Heart Association said. “This is why we take CPR training. We take it for our community, so we can help each other,” Dailey said during the presentation.